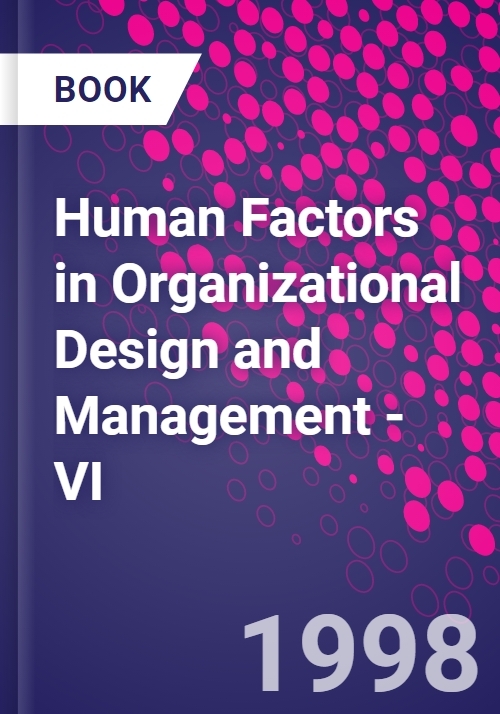 This book contains a series of papers that were presented during the Sixth IEA International Symposium on Human Factors in Organizational Design and Management (ODAM '98). The Symposium was sponsored jointly by the International Ergonomics Society, the Dutch Ergonomics Society, NIA TNO and The Ministry of Social Affairs and Employment. These experiences include new ideas, research results, tools, and applications of human-organization interface technology to improving work systems. New technology, changing work force demographics, changing attitudes and values about work and what constitutes real quality of work life, have heightened the need for a true systems approach to optimizing the interfaces between humans, technology and organizational structures and processes. Growing world competition, and the related need to make organizations more productive and efficient, have further intensified this need to improve work systems. This need is reflected in the rapid development of macroergonomics methods and applications since the first of these ODAM Symposia in 1984. What then was recognized by only a few researchers and practitioners has now become a widely accepted part of the human factors/ergonomics discipline. As demonstrated by the papers contained herein, application of macroergonomics is having a very real positive impact on sociotechnical systems internationally. Included in this volume are a broad selection of papers on theory, methodology, tools, research findings, and case studies from leading professionals throughout the world. This volume thus provides the reader with some of the latest developments in human-organization interface technology. Collectively, these papers should provide the reader with a good conceptual understanding of the ergonomic approach to work system design, and of its tremendous potential for improving work systems and the human condition in all cultures. between politics and participation (I. Posniak). Product Design. Work motivation and competence in five product development teams (M. Martinsuo). Information and Communication Technology. ICT and Organizational Learning. Ergonomics in information technology as a tool for organization design (T.M.J. Lenior). Workplace and Machine Design. Health. What is a 'healthy workplace'? (L.S. Robson et al.). Participation and Workplaces. The workplace: community of learning experiments (C. Clipson, K. West). Job and Task Design. Managerial Aspects. Satisfaction measurement (H. Matsunaga, H. Nakazawa). Health. RSIs: diagnosis, design and implementation (N.L. Menegon et al.). Training and Coaching. Organizational Learning. Computer support for the active training (E.P. Paladini). Ergonomics and Learning. Author index.